In November 2016, Global Implementation Solutions (GIS) hosted a three-day strategic planning meeting for all staff members to be held at Lake Bogoria Spa and Resort in Lake Bogoria, Kenya. This was the first time that some people would put a face to the names and voices they have heard over the mtandao (network). 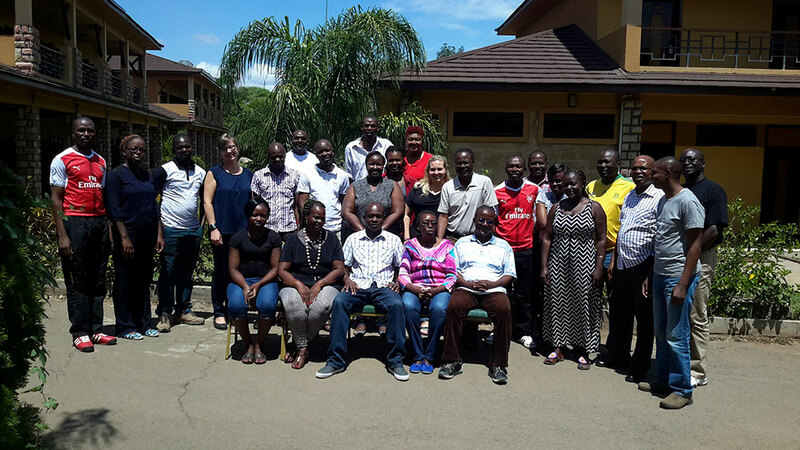 The entire Kisumu staff, as well as Sara Kephart (GIS Business Director from the Chicago office) attended the retreat. It was the first time the whole group was together because many of the staff had been recently hired and much of the technical staff is scattered throughout the region. The retreat allowed everyone to come together for the first time in person. The resort was kind enough to organize for us a farewell dinner on our last night. Music selection varied from soul, gospel and local music. The Jambo Bwana song, the official flag bearing of all mzungu songs in Kenya, of course had to be played for our American colleagues. Papa Lolo by Mose Fan Fan, a Lingala artist definitely gets the GIS members on their feet. Hmm… could this be our theme song. The Erios moran traditional dancers, a sub tribe of Turgen gave an entertaining performance for the team. We took a detour on our journey back to go to the Lake Bogoria Hot Springs which we were told was 13 kms away. I think not! The road was rough, dusty, bumpy and long. Staff wanted to turn back and forget all about the hot springs. Fortunately, we heeded the words of wisdom from our resident choir master who requested us to not be like the Israelites on their way to the Promised Land, in our case the hot springs. The lack of curio shops in the area was disappointing. But several of the business-minded people in the group saw this as an opportunity and were quick to plan for one hypothetically. The area and destination was however worth it. We truly have a beautiful country. The area is well known for having good quality honey and staff didn’t hesitant to purchase it. Debates and discussions were held during the long ride back to Kisumu. The issue of male ostrich sitting on eggs until they hatch was highly debated. Most men saw the Ostrich as a misguided and confused bird. The women obviously defended the action. The retreat provided an opportunity to meet each other in person, to better understood each other’s roles and remove any self-imposed walls and barriers. Kwaheri na tukutane tena kwa mtandao.